One of the smallest of the populated gulf islands, Protection Island is a rare jewel. Like other gulf islands, it has a vibrant and diverse community and rural feel, yet it is located only a 10 minute boat ride from Nanaimo, British Columbia, Canada. Visitors and locals alike remark frequently on the sense of relaxation that engulfs them upon arriving on the island. The island is dotted with forested parks with cedar, douglas fir, gary oak, arbutus, and other trees commonly found in temperate rainforest. There are numerous public access trails to the beach, and three main parks that provide space to enjoy nature. Deer, racoons, otters, eagles, herons, and a variety of other birds and animals are seen frequently. Gravel roads and trails meander about the island, and are used by islanders of every age pushing wheelbarrows, pulling wagons, biking, driving golf carts, and other diverse vehicles that show the inventiveness that island living endows its residents. There are approximately 350-400 permanent residents on this island that measures about a mile by 1/2 mile. It should take about an hour to walk around but usually takes much longer due to frequent stops to chat along the way! Houses range from the original summer cabins to luxury homes. Most back onto waterfront, parkland, or both. Islanders are as diverse as their homes. A significant number are retirees, quite a few work at home, and many commute into Nanaimo for work. There are approximately 30 kids on the island; about half of those who are school-aged boat daily to school in Nanaimo while the other half home-school. Many islanders have their own commuter boats that they keep either at a private dock or at Mud Bay Community Dock. Others rely on the PI ferry which runs hourly year-round with very few stoppages due to weather. While the island is gorgeous, the best part about Protection Island is the community spirit. Everyone greets everyone, islanders are quick to help each other out carrying bags and fixing things, and there are a lot of fun musical and other events put on by the Protection Island Cultural and Historical Society, the Lion’s Club, the DIGS Community Garden Society and other groups. Islanders are also very generous in providing significant support to islander founded Village Medical Project of Sierra Leone. 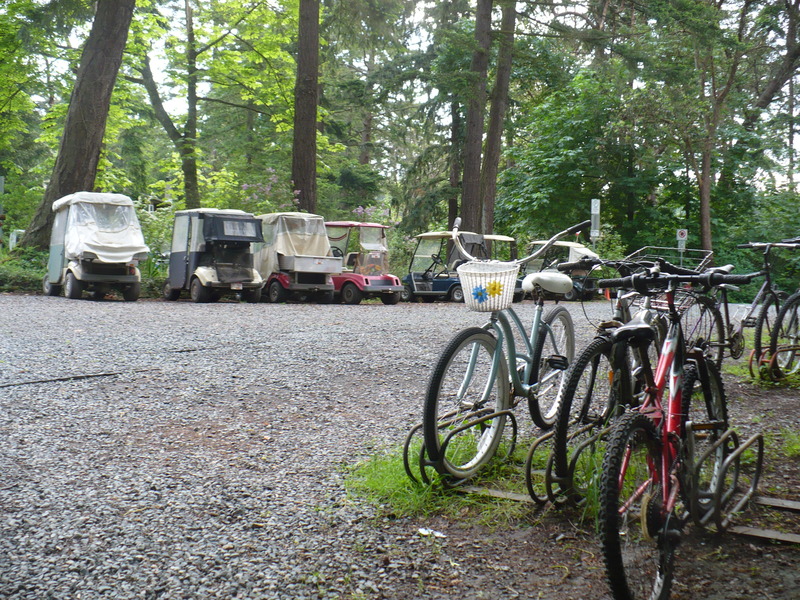 Protection Island is home to many artists. Alison Watt is an accomplished painter and she also offers popular workshops on the island. For more information go to http://www.alisonwatt.ca. Krista Winter is a potter who makes one of a kind clay creations reminiscent of the sea, and more. You are welcome to call to see her work; when you arrive at Ahoy Guesthouse, you can find contact details in the Guest Info Binder. Krista also offer pottery lessons and workshops – let us know if you are interested and we can see what is available when you are staying with us. Lessons must be booked ahead. “Charlie” is a carving created by former islander, artist Danny Muhi. This is easily his best known work on the island and has become a tourist attraction. You’ll figure out why as soon as you see Charlie! The only commercial establishment on Protection Island serves pub food and a wide selection of beverages at lunch and dinner times, and sometimes for Sunday brunch. There is inside and outside seating in adult-only and family sections; all of it is floating! Regular entertainment includes live music many weekends (and a few weeknights) and Name that Tune on Thursday nights. On Wednesdays during summer season the Dinghy Dock sponsors a sailing race – fun to watch from the pub! There are special events periodically such as dances, murder mystery night, and a New Year’s party. For menus and more, go to their website. Note that there are sometimes closures during the winter months. UPDATE – As of Spring 2016, it appears that the colony has moved. You can still see the nests, and there are herons around the island, but we are sad to report that the active colony is no longer. The Honesty Store is a highlight for many visitors (especially the young ones!). An honesty store is an unstaffed store where visitors pay into a cashbox and record themselves what they have taken. In this case, it is a beautifully created booth filled with crafts, honey, and a variety of other items. Kids love the blackberry honey sticks! Protection Island has several healthcare practitioners that offer their services on an irregular basis. If you book a stay at Ahoy Guesthouse and are interested in massage or reiki while you are here, let us know before your stay and we will see what is available. 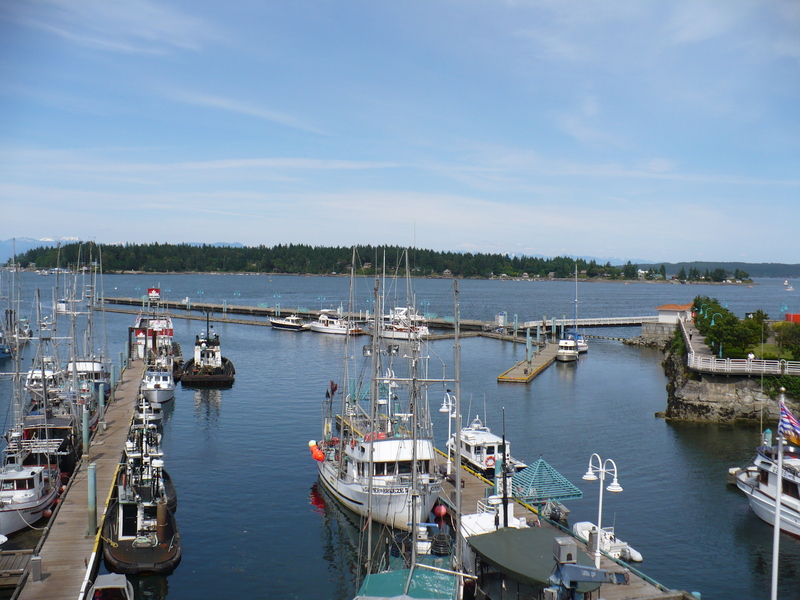 Pirates Park is located near the ferry and faces Nanaimo Harbour. Instead of going straight from the ferry along Pirates Lane, you turn right and enter the park. This park includes the community dock that we and other islanders use daily for our commuter boats, a playground for kids, a volleyball net (weekly volleyball on Sundays), picnic tables, and lawn/trees/beach.Look for another sculpture by Danny Muhi incorporated into the natural surroundings. This park is on the east side of Protection Island with a gorgeous view towards Gabriola Island. It has some nice sandstone formations as well as a partially sandy beach that is very nice for swimming. The park itself includes Gary Oak trees, wildflowers, a pond (called “lake” on many maps), and some nice trails. A bench and picnic table near the beach are great for picnics.